Rejuvenates and moisturizes your complexion from the inside out. Helps to restore your skin to its youthful appearance. Increases your skin’s ability to retain moisture for a younger looking complexion and acts as an additional line of defense against aging, skin damage, and loss of elasticity. Clinically proven in a study from Japan as a superior plant derived Phytoceramide supplement. Ceramide-PCD derived from rice bran has been used in Japan for years! Now FDA approved and available in the US. Manufactured in the US. Safe for those who have wheat or gluten sensitivities. Helps you to look as young on the outside as you feel on the inside! Plumps your skin to reduce fine lines and wrinkles. 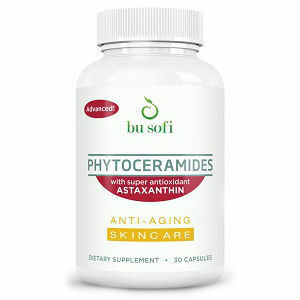 Helps to replenish ceramides that you lose as you age which improves the structural integrity of your skin. Provides nutrients on a cellular level that rehydrate and nourish your skin. In a study comparing 40 mg Ceramide-PCD with other phytoceramides with 350 mg Lipowheat or wheat derivatives and sweet potato/konnyaku, Ceramide-PCD was shown to have a superior moisturizing effect with a moisturizing ratio of 35%. The product contains Ceramide-PCD derived from rice bran. The product source, however, provides no further information about product ingredients including ingredient type or amount. 1 capsule daily for adults. $ 36.95 for a 30 capsule container (a 1 month supply). The product can be sold on line through Amazon. The product manufactured advertises a 60 day no questions asked guarantee but provides no information as to when the 60 day period starts (date of purchase or date of delivery). The product source also does not provide a customer service contact number itself although Amazon does provide such a number. Finally, the product source also does not include any product testimonials. This may be a helpful product but the product cost is a concern at $36.95 for a 1 month supply (taking 1 capsule a day as recommended). This product is expensive. Other concerns include the fact that the product source does not contain an ingredient list and provides only very limited ingredient information. Finally the product source does not provide any way to contact the manufacturer directly. Users instead apparently need to go through Amazon. Given these factors any one considering purchasing this product would almost certainly want to have a health care professional review the product first. Jack Webster	reviewed Bu Sofi	on February 4th	 and gave it a rating of 2.